ELVES DELIVERY BEER BY AIRSHIP AT THE LEMBECK & BETZ BREWERY! 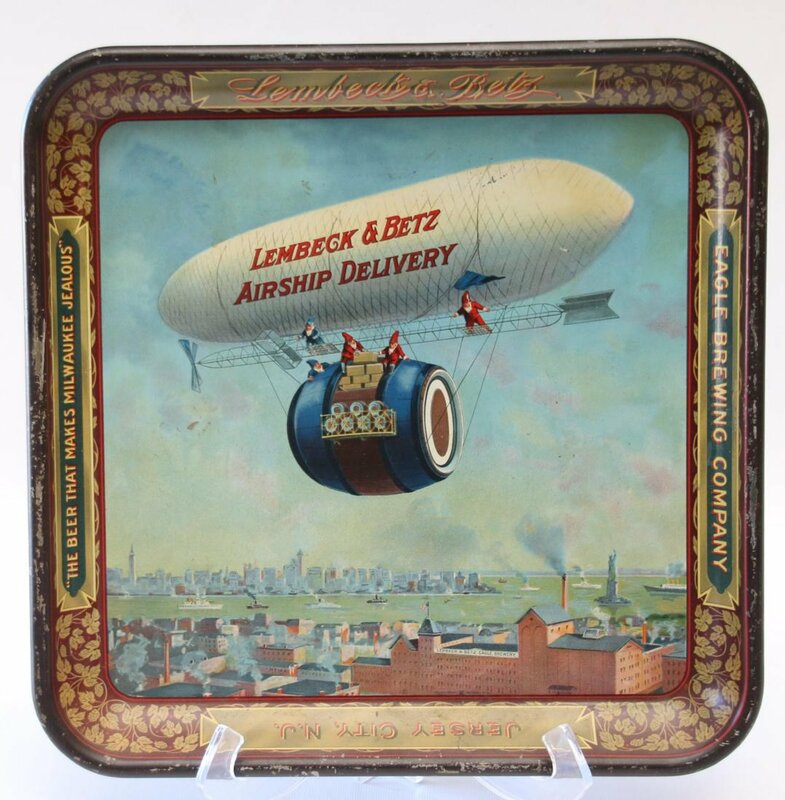 What a great image on this serving tray from the Lembeck & Betz Eagle Brewing Company in Jersey City, N.J.! I love the elf characters flying on an airship or dirigible and are delivering beer to their thirsty customer base. The tray has a slogan on the side which says “The Beer That Makes Milwaukee Jealous”, a direct slap at one of the largest brewing cities in the United States before prohibition when this tray was made. If you look closely, you will see the airship is actually a large wooden beer keg, which also has smaller kegs and wooden beer cases in the main storage areas of the cabin of the airship. The use of elves flying the plane is also creative. When I think of magical things happening, it’s not surprising to see an elf flying the airship incorporated into the scene. There is so much creativity to the tray as it stands now. The tray also has great color too! 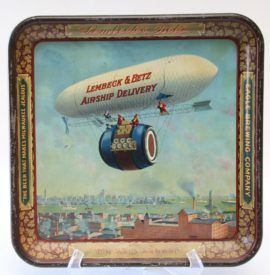 This particular tray is not a stock tray to my knowledge, meaning this scene I believe was used only by the Lembeck and Betz Brewery in Jersey City, New Jersey. THE MASCOTTE CIGAR’S INTERESTING CHOICE…THE MATHIE BREWING CO. WAGON HAULS A GIANT BOTTLE OF BEER!